Cape Diamonds is a licensed manufacturer and exporter of polished certified diamonds and precious metal jewellery. 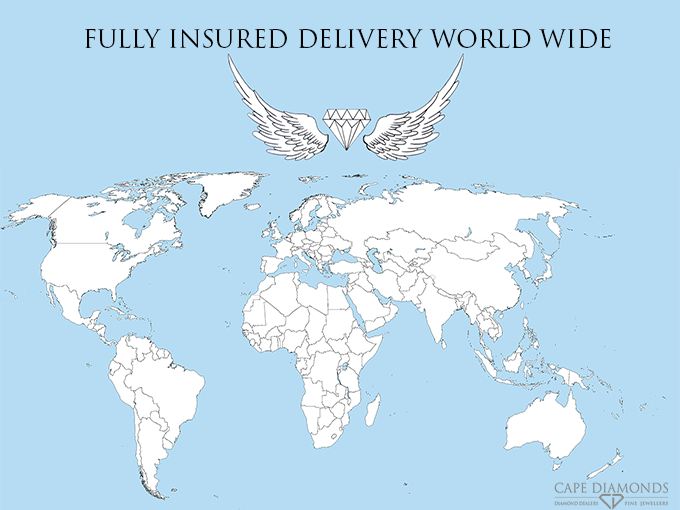 We ship fully insured and totally secure national and international delivery. All delivery of diamonds, engagement rings, and jewellery to Cape Town, Stellenbosch, Paarl, Johannesburg, Pretoria, Port Elizabeth, Durban and Bloemfontein and other cities in South Africa with major airports will have delivery in 24 hours. Smaller towns in South Africa will have delivery within 48 hours. Please make sure you have identity documents or drivers licence to present to currier company on receipt of parcel. 3-4 working days for all international deliveries of all diamond jewellery without any custom delays. All Parcels should be delivered within these time frames and if for any reason there is a delay, please notify us so we can help speed up customs and deliveries. will be notified by your sales representative immediately. Please make sure you have identity documents or drivers licence to present to Currier Company on receipt of parcel. All shipping is done via RAM Safe Hands couriers or DHL, all parcels will be delivered by “safe hands” fully insured door to door. Shipping/delivery will be R590 to all areas in South Africa. Cape Diamonds will not be held liable for any loss or damage on goods/parcels out side of the shipping/delivery process. Once your parcel has been dispatched, you will be notified via email with your waybill number for tracking purposes. This number will allow you to track /locate your parcel in transit until it reaches your chosen destination. In the unlikely event of lost, stolen or damaged goods the cost of such will be covered by the Courier Company and subject to their terms & conditions or our insurance company. In the unlikely event of lost, stolen or damaged goods, the cost of such will be covered by our independent insurance company and subject to their terms & conditions. Cape Diamonds does not include custom duties in its order price. You may be required to pay duties on your parcel upon arrival in your country. Please contact your local authorities/customs to confirm rates/taxes. Best idea is to pop into our Jewellerey manufacturing workshop or showroom to collect your jewellery personally.